I have watched Thoroughbreds, Quarter Horses, Trotters, Pacers, Greyhounds, and rats run after cheese at a Turner’s Derby party. It’s safe to say this handicapper has seen about everything. That is until this Friday at Belterra Park. Race #7 on the card presents a unique set of runners. There is a field of eight slated to go to post, and it’s a condition allowance event. Nothing out of the ordinary, right? 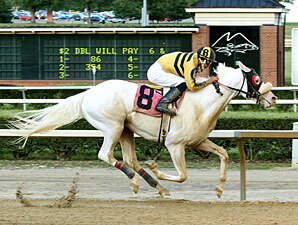 But in this race, there are two white Thoroughbreds that will face off against each other. I looked over the card, and the field offers up plenty of questions that will provide only one answer. The race is slated at 6f, and #1 -Chief White Fox broke his maiden three race back at Mountaineer Park. This four-year-old son of The White Fox has run on poly, turf, and cuts back to a sprint from a 1 mile and 70 yards. His white nemesis is #7 -Wear the Mask. He is 6/6 ITM in 2014, and makes his second start over the Belterra Park oval after finishing second first time off the shelf. This Nevada-bred has been racing in Ohio for his career with a couple of efforts at Mountaineer in West Virginia. That sets the stage, and the only question that still lingers is will this rare face-off produce a white horse to win the race? For me, I’m looking forward to the unique race as two rare color Thoroughbreds will do battle. Either could win the race, but they’ll have to bring their “A” game as Doug Cowans brings a son of Henny Hughes who was impressive in his maiden score as the favorite at Mountaineer. If you are watching and wagering on the races on Friday, take a look at race #7 at Belterra Park. – They go to post at 5:54 p.m. ET. Hi..Thanks for such a wonderful post. I was looking same article from many days. thanks once again for sharing your ideas.